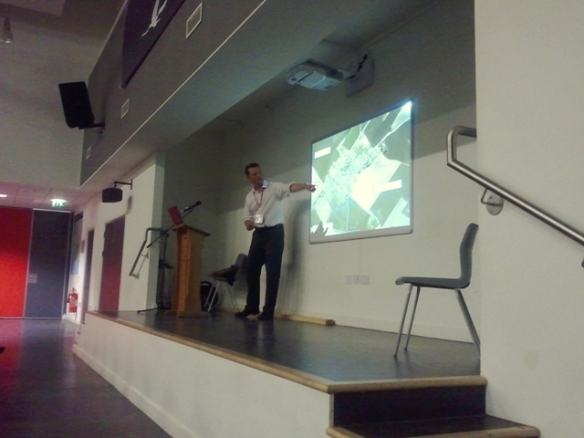 On 13 June I gave a talk to 65 students and staff at South Bromsgrove High School on the work of the La Boisselle Study Group. Soon after media coverage began on our work in June 2010 I was contacted by James Wilson from the History department who was keen to learn more and, if possible, visit the site on the annual school battlefield trip. My talk focussed on our current archaeological work as well as the wartime history of the site. It was satisfying to be given the opportunity to do justice to the resolute French fighting for the village and Granathof in 1914/15. French efforts on the field of battle are often overlooked, something that we are seeking to redress at La Boisselle. I went on to talk about the handover to British troops in summer 1915 and their subsequent efforts, both above and below ground. Sadly, this year it was impossible to show the school’s battlefield trip around the site but we aim to do so next year. I have also been asked back to the school to speak next year and look forward to visiting again. My thanks to James Wilson and his colleagues for their generous welcome and feedback. Many thanks to the students for their faultless attention. As a firm believer in the power of education it was immensely rewarding to be able to share my experiences of La Boisselle to school students. Should you be interested in having me talk at your school or group then please contact me directly.